Individuals with speech, language, or cognitive deficits can greatly benefit from the massive amount of speech therapy apps on the market. Apps can provide a context for communication and easily accessible ways to facilitate the achievement of therapy goals. Plus, research shows that additional practice outside of speech therapy has been shown to help individuals make advancements and improve their speech skills. In fact, many clinicians and speech-language pathologists have dedicated resources and their clinical knowledge to developing speech-related apps. These apps are a quick and easy way for adults to practice their speech, language, and cognitive skills. TalkPath News - Individuals with speech and language disorders often report difficulty understanding the news. This app was developed to help solve for this issue. The news app is updated Monday through Friday with news stories read a slower pace. It's free to use and available for download on the App Store and Google Play. Counting Money - This app is designed to help people of all ages count money. Counting Money can also be used as a brain training exercise for adults and any one else looking to improve their skills at counting money. It's free to use and available for download on the App Store. SmallTalk Aphasia - Designed for people with aphasia, an impairment in the ability to use language, SmallTalk Aphasia provides a vocabulary of pictures and videos that talk in a natural human voice. It's free to use and available for download on the App Store. SmallTalk Oral Motor - This video-based app is designed for people with weak mouth, tongue, and lip muscles and/or poor oral coordination. The app contains videos illustrating cheek, tongue, palate, lip, and jaw exercises. It's free to download and available on the App Store for the iPhone and iPad. Dragon - Many individuals with aphasia have trouble writing, but they can speak just fine. Dragon app can help dictate a user's voice into an email or a text message. The app is available on the App Store and can be used on the iPhone or iPad. TalkPath Therapy - The TalkPath Therapy has more than 13,500 speech and language exercises in one app. Users can select different levels of difficulty in exercises like reading a menu, telling time, and spelling words. It's free to download on the App Store and available for the iPad. Music Game - Music Game is a classic memory game, except instead of cards, you play with music. Colored buttons light up and play a sound, creating a tune. After each note is added, you try to recreate the pattern by tapping the buttons. It's a great app to practice memory recall. It's free to use and available for download on the App Store. Flashcards for Kids - We realize the name of the app says for kids, but the content of the app applies to all ages. Use the flashcards to review household items and common food names. Plus, a new features allows adults to make their own flashcard. The app is free to use and available on the App Store. 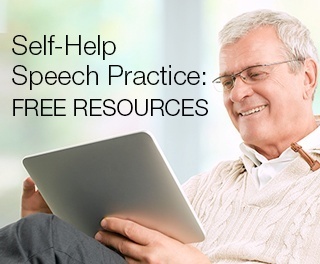 We offer 14 communication and practice apps for FREE! Download our app guide to learn more about all of our apps!